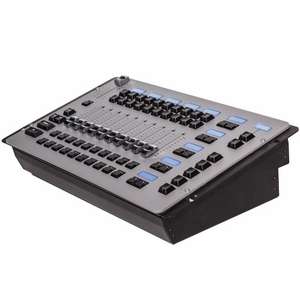 The M-Series Playback ll Module extends the playback capabilities of any M-Series console by adding 10 motorized faders and 10 PlayPaired buttons. Cuelist information is displayed on 10 LCD displays, 5 Fast Keys for quick access to banks and other functionality, a Master Go section and a Grand Master fader with flash. Multiple Playback Modules can be added to the M-Series console.